The Fourth of July is a holiday for celebrating America’s independence loudly and proudly. This year, gather your family, friends, and neighbors and come out to one of these events right here in Inverness. On the evening of July 3, join the community in celebrating the stars and stripes at Liberty and Wallace Brooks parks. At 5 p.m., food trucks and Cone Beer vendors will be open and ready to satisfy your hunger and thirst. At 6:30 p.m., the opening ceremony will be hosted by the mayor, city council members, and the Nature Coast Young Marines. At 7 p.m., Rhythm Express will begin playing all your favorite funk and classic Motown tunes. Finally, at 9 p.m., a breathtaking fireworks display will take place over Lake Henderson. As a part of this year’s Patriotic Evening, Wallace Brooks Park will also be hosting the family-friendly and kid-centric Patriotic Rock the Park event. 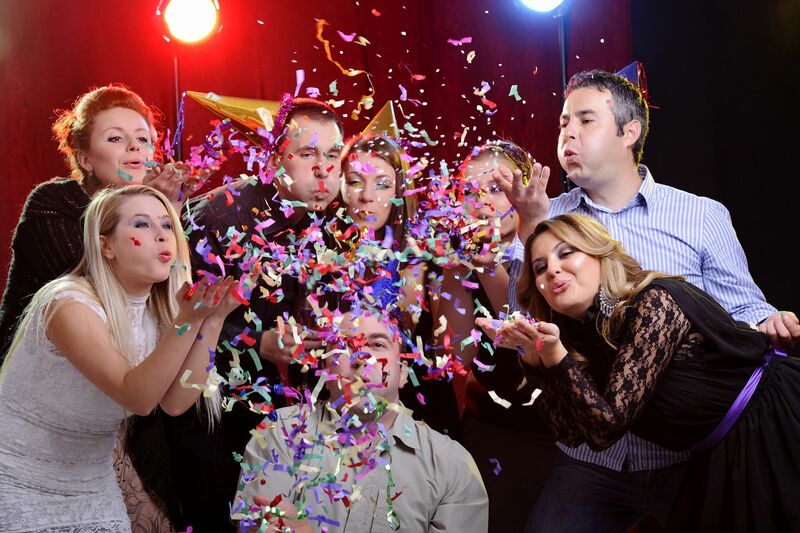 Starting at 6 p.m. on July 3, DJ Trae and Ryan Downs will be leading fun activities and playing plenty of hit tunes. Children can enjoy tug-of-war, free face painting, and more. The opening ceremony starts at 6:45 p.m. and wraps up at 9 p.m. with the Lake Henderson fireworks show. 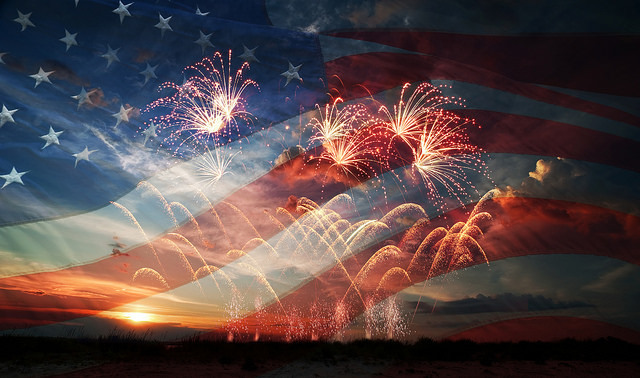 Happy Independence Day from everyone at Nick Nicholas Ford in Inverness, FL! If you thought the racing season couldn’t get any more exciting, think again. 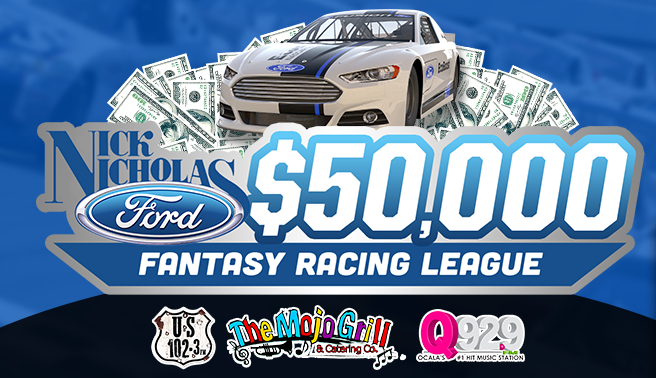 Join us for the Nick Nicholas Ford Fantasy Racing League 2018 to compete against other stock car racing fans for a chance to win a $50,000 grand prize, along with plenty of weekly prizes. If you haven’t already, tell your friends and get ready for a whole new level of racing-season excitement! Through November 18, we designate a race event to follow each week. After you have successfully registered to participate online, you can submit a Top 10 Finisher prediction for each week’s race. This submission must include your predictions for the top 10 finishers in their exact order. Each week, you’ll receive three points for each predicted driver that finishes anywhere among the top 10 finishers and 10 points for each driver who finishes in the exact position that you predicted. Make sure you choose carefully each week, though, because the prize for correctly predicting all top 10 finishing drivers in their exact order for any given week is $50,000 cash. Even if you don’t nail your predictions on any given week, it’s still possible to win $500 for accumulating the most points over the length of the season. One of the most compelling pieces of evidence to surface is that the Ford EcoSport Storm’s front grille bears a suspicious resemblance to the grille of the F-150 Raptor. Other cool features appearing on the EcoSport Storm include 17-inch wheels, black and orange leather seats, and an 8-inch touchscreen to go with the updated SYNC 3 infotainment system. The possibility of the U.S. Ford EcoSport getting a Raptor performance model is still up in the air. 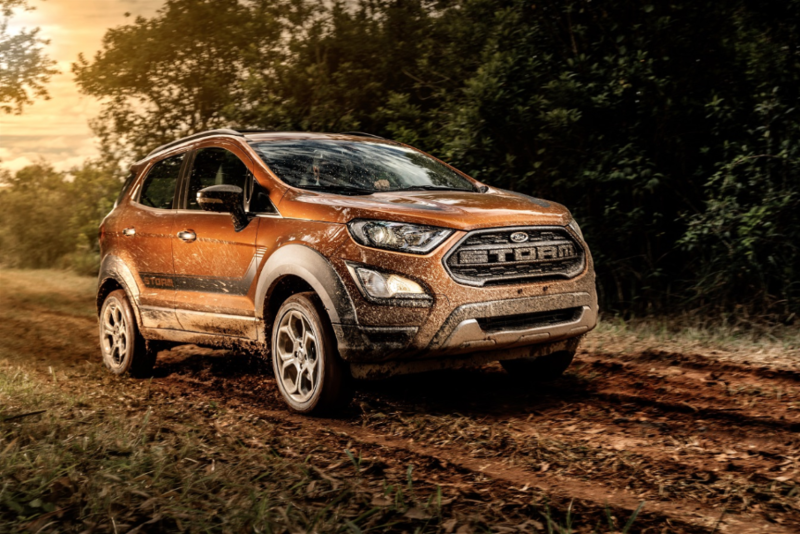 However, with the EcoSport’s Brazilian cousin getting a new, sportier trim and other Ford vehicles getting Raptor variants, we at Nick Nicholas Ford are hoping that this small crossover will get its turn in the spotlight. Compact and subcompact vehicles are all the rage, offering drivers desirable SUV capabilities with the smooth handling and comfort of sedans. In response to the desires of contemporary drivers, Ford will be adding a new compact CUV version of the KA+ to its lineup in 2018. 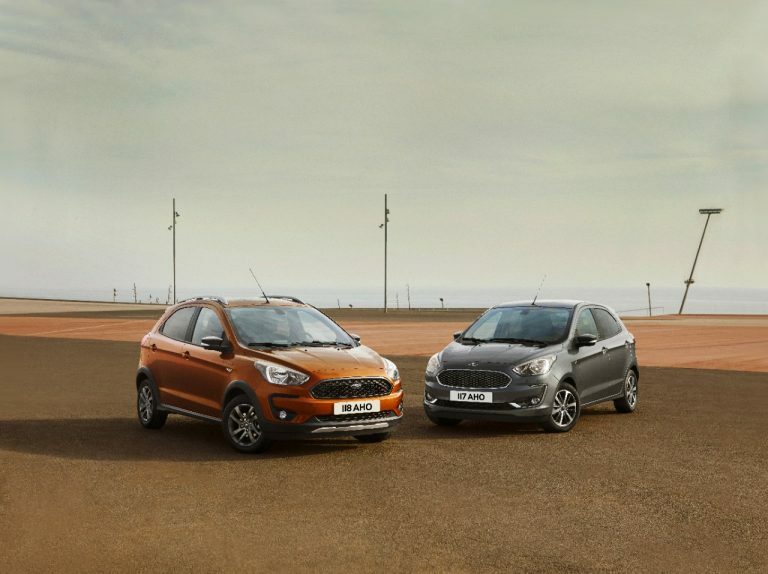 The Ford KA+ Active will offer even more functionality and style to you because it features a higher ride height, sportier styling, and state-of-the-art safety and entertainment technology — including Ford’s exclusive SYNC 3 system. In 2018, the affordable price of the new KA+ Active will make a great crossover accessible to more drivers. The KA+ Active offers up-to-date technology and sleek styling that typically is reserved for more expensive vehicles. Along with smart tech and style, the KA+ and KA+ Active have two powertrain options, including an all-new 1.2-liter Ti-VCT three-cylinder engine that delivers better torque and fuel efficiency than previous models. There is also a diesel engine option that features Smart Regenerative Charging for even greater fuel efficiency. At Nick Nicholas Ford, we believe that smart, capable vehicles shouldn’t come with a prohibitive price tag. Visit us to learn more about the Ford KA+ and KA+ Active Crossover. Around the beautiful town of Lady Lake, Florida, there are plenty of places to go golfing and enjoy a leisurely afternoon with friends and community members. 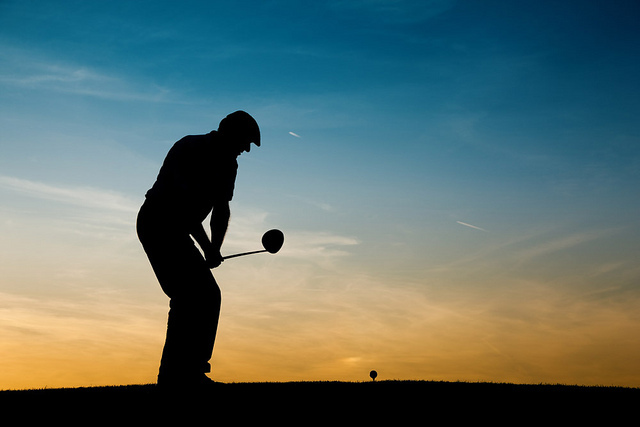 Here are some recommendations from us at Nick Nicholas Ford on where you can spend a pleasant day golfing and socializing. This is the oldest 18-hole golf course in The Villages, stretching 6,213 yards and featuring beautiful old trees. You can easily navigate the course from the comfort of a golf cart and enjoy the scenery. The course challenges you to work with various clubs while also maintaining a leisurely pace. While here, you can also enjoy lunch at the club restaurant and take advantage of the putting and chipping green. The Lakes of Lady Lake Golf Course features four tees that are suitable for all skill levels, so you can feel comfortable as you work on your game. The course offers great value as well as great putting. It sits on a 4,174-yard track and is mostly a mix of Par 3s and 4s. This course has served the Lady Lake community since 1995 and is dedicated to providing a lovely experience to all. Located at the Water Oak Country Club on 300 acres of land, this course is meant to be a little challenging, but you can meet it at your own pace. The golf club also offers a clubhouse to socialize, a putting green, and a pro-shop with apparel and equipment so you can update your old clubs. Practice makes perfect, and there’s no better way to improve your game than taking the time to do so at the Lady Lake Golf Driving Range. Opened in October 2017, this driving range is staffed by volunteers and proceeds go to local charities. It is also golf cart accessible. For those looking for fun things to do in Inverness this February, check out Friday Night Thunder. 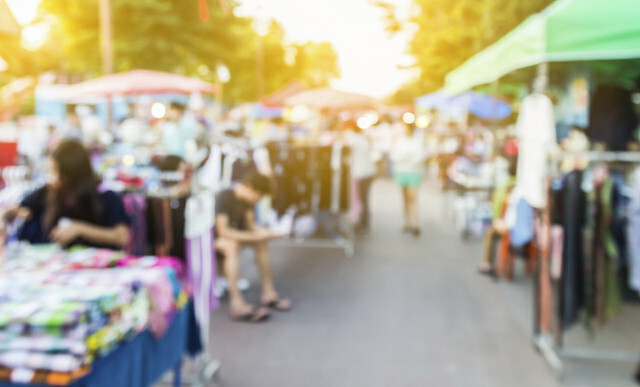 You can spend the evening in the downtown area listening to live music, dining or enjoying shopping deals. There will even be cruise-ins from groups like Nature Coast Mustangs and Citrus MOPARS. This is one fun event you don’t want to miss! According to the Inverness website, Friday Night Thunder will be held from 5 to 8 p.m. in the Historic Downtown area of Inverness on Friday, Feb. 16. This is a great way for residents to get out and explore the community, as there are a range of events to appreciate. If you’re a music lover, you may have a chance to see top performers in the area. Plus, with discounts on food and local shops, it’s the perfect time to go out. Normally held the third Friday of every month, Friday Night Thunder is also a chance for auto enthusiasts to get together. For instance, Nature Coast Mustangs, a charter club of the Mustang Club of America, will pay a visit to the event. With pony rides, car shows, and competitions, this is a gathering of some of the coolest cars in the area. At Nick Nicholas Ford, we can’t wait for the upcoming Friday Night Thunder event! A new year is just around the corner. And with it, comes the perfect opportunity to finally make those changes to your life that you know are for the best. One area of your life to consider is whether or not your current car is holding you back. Perhaps you’ve skipped a trip because you car isn’t the most dependable, or spent money on a plane ticket and missed out on the scenic route because your vehicle just can’t cut it. Or maybe you’ve been putting off that home project that you’ve always dreamed of because acquiring the tools and supplies is too difficult in your current ride. No matter the reason, your car shouldn’t hold you back. Instead, it should enable you to live the kind of life you want most. Whether that means an adventurous trip to the mountains, or the ability to pick up everything you need to build that tree house for the kids, you deserve a vehicle that’s ready for everything you are. This New Year, visit us at Nick Nicholas Ford to find the vehicle that will take you everywhere you want to go. Ford’s versatile SUVs all have one thing in common: they are expertly crafted to let you do all the things in life you want. We at Nick Nicholas Ford are all excited for the holiday season here in Inverness, even if snow isn’t typically on the radar here in Florida. 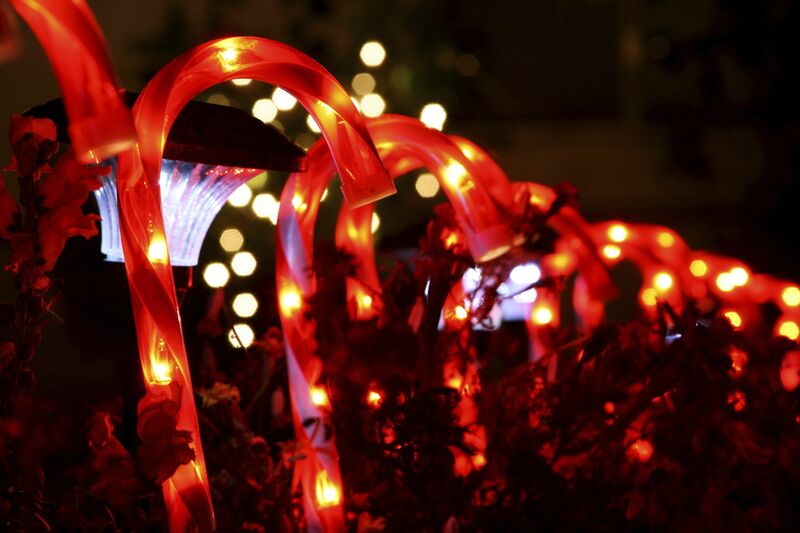 One of our favorite traditions is Light Up Inverness, which will be held this year on Friday, Dec. 8, from 5 to 8 p.m. in Historic Downtown Inverness. What is Light Up Inverness? So, what is Light Up Inverness? It’s a wonderful (and free!) opportunity for the community to come together and watch the big tree be lit up at 6 p.m. While downtown, you can enjoy your favorite Christmas tunes inside the Old Courthouse and see snow flurries over the Valerie Theatre. You and your loved ones can also visit the Christmas Gift Market, ride on a train or in a horse-pulled carriage, and see Santa and his little helpers. Come hungry, as there will be food trucks on site, and be ready for great entertainment: you can see the Citrus High School Choir perform at 5 p.m. and watch Valerie Theatre put on Miracle on 34th Street at 6:30 p.m. following the tree lighting. Need a new ride to travel to Light Up Inverness this December? Browse our inventory of new and used cars, trucks, and SUVs at Nick Nicholas Ford here in Inverness, Florida. There is a whole lot to love about the new 2018 Ford F-150. It is America’s best-selling vehicle for a reason, after all. But if we had to narrow it down, we would say these are the five best features of the 2018 Ford F-150. Do you agree? By using high-strength, military-grade, aluminum alloy, Ford has ensured that the new F-150 is tough and durable but also highly efficient. The 2018 Ford F-150 offers a wide range of powerful engines, including the 3.3-liter Ti-VCT V6, 2.7-liter EcoBoost®, 5.0-liter Ti-VCT V8, and 3.5-liter EcoBoost®, which produces 450 horsepower in the Ford F-150 Raptor. Coming in the spring of next year is a fifth engine option for the 2018 Ford F-150. You guessed it—it’s a diesel. 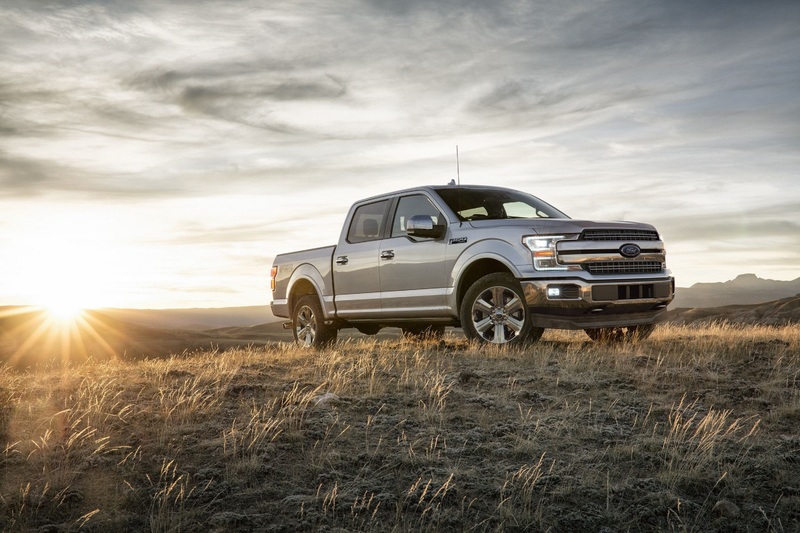 The 3.0-liter Power Stroke® Turbo Diesel will likely help the F-150 achieve some segment-bests. Speaking of segment-bests, the 2018 Ford F-150 offers best-in-class towing of 13,200 pounds. This isn’t a segment best; it’s a segment-only. The class-exclusive remote tailgate release is operated via the key fob or an inside door switch for easy access. Are you interested in learning more about the 2018 Ford F-150? Visit us at Nick Nicholas Ford in Inverness, Florida, today for a test drive.